The City of Toronto has completed a Municipal Class Environmental Assessment (EA) study for the Downsview Major Roads network. The objective of the study was to recommend a design for the new road network. 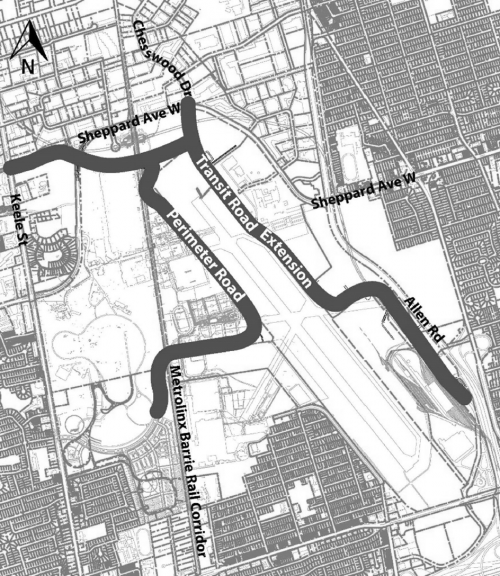 A four lane 2.3 kilometer (km) long multi-modal northerly extension of Transit Road to provide a connection to Chesswood Drive and Sheppard Avenue West. A four lane 1.2 km long multi-modal westerly extension of Transit Road across Sheppard Avenue West to Keele Street inclusive of an underpass at the Metrolinx Barrie Rail Corridor. A two lane 2.6 km multi-modal road running south from the future Transit Road inclusive of an overpass across the Metrolinx Barrie Rail Corridor. The recommended alignments have been refined to maximize the potential for parks, boulevards, developments and employment opportunities. The recommended transportation network design applies a multi-modal approach including connected multi-use trails (e.g. for cycling), wide sidewalks and one to two traffic lanes in each direction on the roadway. Read the more detailed Executive Summary. A Transportation Master Plan (TMP) was completed as part of the Downsview Area Secondary Plan in 2010. These major roads identified in the TMP are needed to address the severely constrained existing road network through the site, reduce congestion along surrounding roads, such as Keele Street and Sheppard Avenue, and to allow for redevelopment of the Downsview Area to occur. The City hosted a public drop-in event on October 26, 2016, from 5 p.m. to 8 p.m. at the Community Engagement Hub within Downsview Park (70 Canuck Ave.). If you require assistance in reading these materials, please contact the Senior Public Consultation Coordinator listed in the Contact Information section. Please call or check online for hours of operation. If you have any outstanding issues with this project, please address them to City staff listed below and we will attempt to seek a mutually acceptable resolution. You have the option of sending a written request to the Ministry of the Environment, Conservation and Parks to request an order for the project to comply with Part II of the Environmental Assessment Act (referred to as a Part II Order) which addresses individual environmental assessments. A copy of the request must also be sent to the City contact. The last date when these requests can be received is August 27, 2018. Minister of the Environment, Conservation and Parks.